Who says Google is just for the geeks? Last week it proved it cares for fashionistas too. 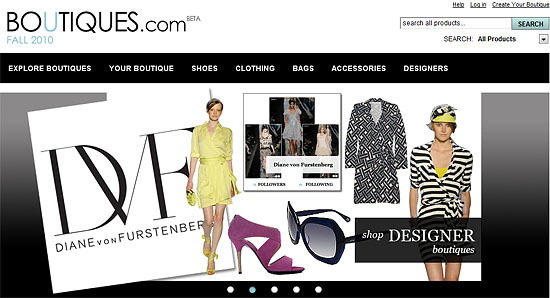 Google launched a revolutionary online site featuring celebrities fashion and personal styling - Boutiques.com. Site visitors can explore boutiques to browse clothes and accessories by celebrity, designer, blogger, retailer, trend and styles. The products you see on Boutiques.com are sold by online retailers who submit their products to be listed on the site. The concept of may not be unique as ASOS.com (As Seen On Screen) lead the way to this kind of online fashion shopping experience showing how to copy the looks of celebrities and fashion icons. But Google is able to provide perhaps the best feature to make fashionistas and shopaholics lives easier and merrier, the Create Your Boutique function. Clicking on Create Your Boutique will take you to the Stylyzer Quiz where you can choose between a series of photos to help determine your style genre. As soon as you finish the quiz, you will receive your suggested style genre, which you have the option to save. Then you will be asked to create a Boutiques.com account, so the next time you login you will have a personalized shopping experience showing products according to your own personal style. You can also configure again your style love/hate preferences.